Yep! It's true. You can use your gorgeous Apple smart watch or even your iPhone itself as your step tracking device and have those steps sync automatically with your Walker Tracker account. In either case, you will be pairing the Apple Health app that runs on your iPhone with Walker Tracker. The first step to making sure this pairing is a success is to verify which tracking device has priority in the Apple Health app. Immediately below are the instructions for verifying that in Apple Health. Open Health, then tap the Health Data tab. Once you are sure the proper device has priority in the Apple Health app you can then activate it in Walker Tracker. To pair your iPhone Apple Health app to the Walker Tracker app, download the Walker Tracker app You can find our app here. 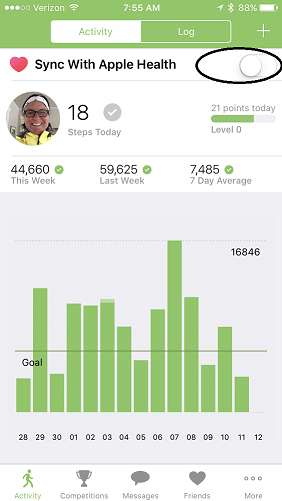 Once you have downloaded the Walker Tracker app and logged in, you will the see option for toggling on Apple Health. Once, you've toggled the option on, steps from the current day and forward will begin to populate your Walker Tracker account. NOTE: Any steps prior to the day you pair Apple Health will not be available to Walker Tracker. Questions? Don't hesitate to send us a message at support@walkertracker.com.